Katie Chin introduces her newest cookbook Katie Chin’s Everyday Chinese Cookbook: 101 Delicious Recipes from My Mother’s Kitchen now available to buy. 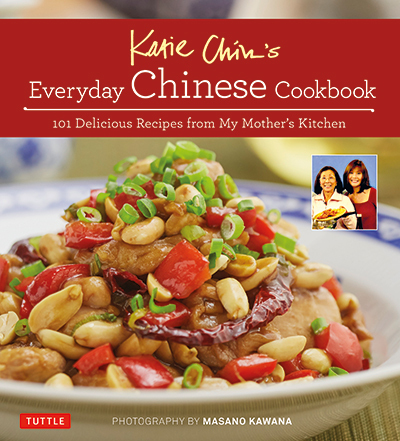 The book pays homage to Katie’s late mother, the legendary chef and restauranteur, Leeann Chin. Sharing a collection of beloved family recipes, Katie weaves a compelling tale of Leeann’s life and her pioneering role in popularizing Chinese cuisine in America. From Chinese classics like Kung Pao Chicken and Shu Mai, to the Chin’s signature Firecracker Shrimp, recipes defy the intimidation factor often linked to Asian cuisine. The book promises to inspire even the novice cook to try their handiwork on the delicate pleating of a Shu Mai dumpling. Raised in Minneapolis and later settling in LA, Katie’s early adult life was mainly spent out of the kitchen, until Leeann put things into perspective: eating at a restaurant takes two hours, whereas cooking for one’s self can take less time and allows the cook to control what goes into the food. Heeding her mother’s advice, Katie returned to the familiar Chinese recipes she grew up making and found her love for cooking reignited. In her signature warm and inviting way, Katie speaks to the everyday home cook, sharing the quick recipes that will get dinner on the table in a snap, as well as the dishes that are a true labor of love. “Katie Chin brings us into her Chinese-American kitchen and makes our mouths water with recipes that beg to be cooked and shared. She writes with warmth and enthusiasm, and best of all enormous love and respect for her one-of-a-kind mother, who taught Katie everything she knows about authentic, simple, fresh Chinese cooking.” —Katie Workman, author of Dinner Solved!